If you always eat up the meals in a jiffy, it seems you need to refurbish your dining room. A dining room is not only a place for eating, but also gathering with your family while catching up with them. 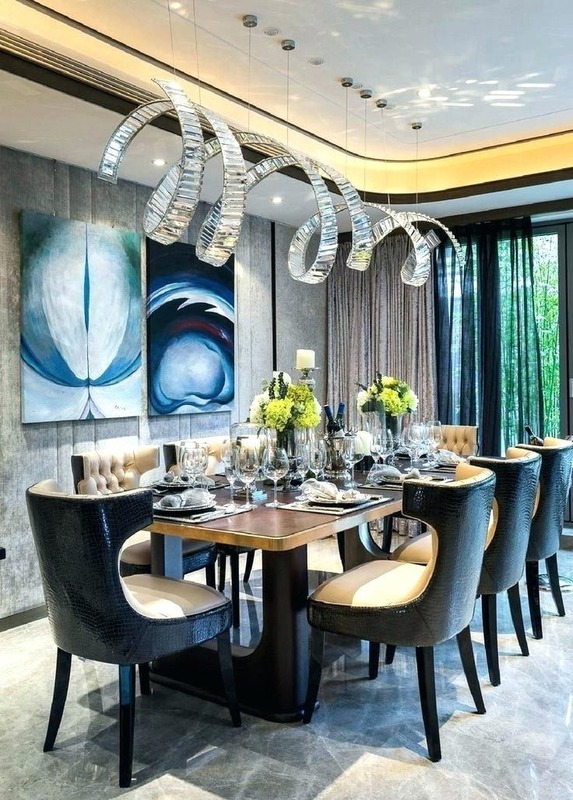 Therefore, it deserves these 10 luxurious dining room ideas that can make you and your family feels comfortable to linger for a while. 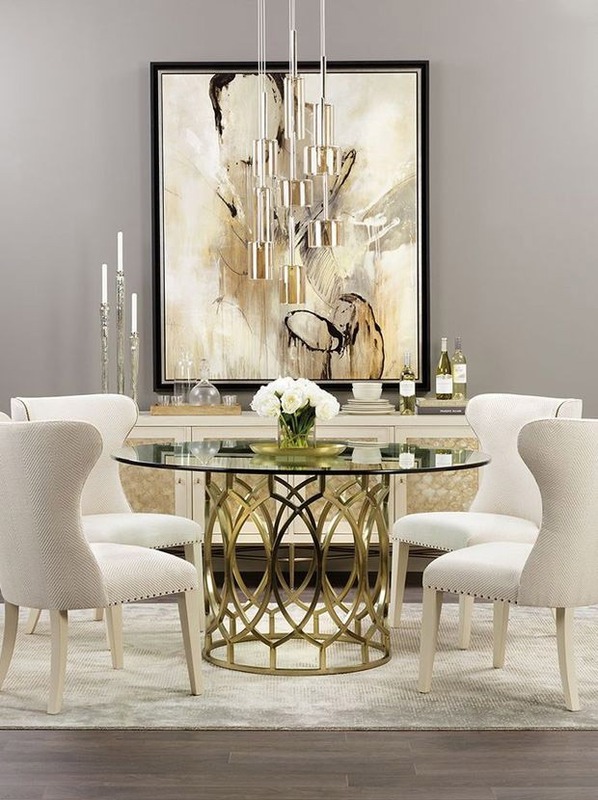 This dining room is not too big but it is quite luxurious with a golden pendant light hanging over the brown sleek dining table with a white accent. The dining table is surrounded by comfortable white linen chairs that have the same hue as the accent of the table. Besides the glass door cabinets that show your knick-knacks out, it also features a wall-mounted LED TV set. The TV panel complements the table and chairs with its brown and white design. Installing a TV set in a dining room entails some benefits and drawbacks. It enables you to enjoy your favorite TV show with your family while enjoying the meal. However, it can hinder you to have high-quality conversations with your them. A modern dining room can be luxurious. 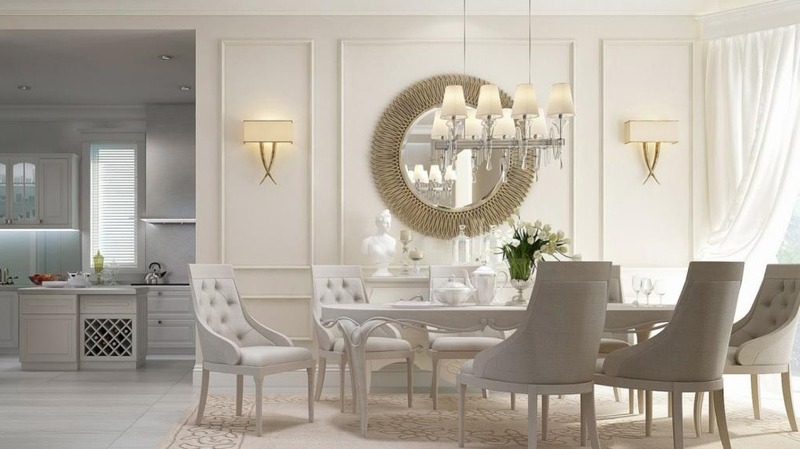 The key is the use of unique chairs and beautiful decorative lamps, just like this white modern dining room. It is not as sophisticated as the one in a Victorian style, but its simplicity makes it look lavish. The white chairs and table with clean-line edges sit perfectly on the white fluffy rug that looks like a soft cloud. Above the table is a simple yet beautiful decorative lamp. A white permanent room divider keeps the dining room separate from the living room and kitchen so that you can have a more private place to enjoy your meal. One of the most convenient tricks that you can use to make a small room look visually bigger is by adding one huge mirror that can reflect the dining room so that it looks larger. This dining room is not only luxurious, but also unique. 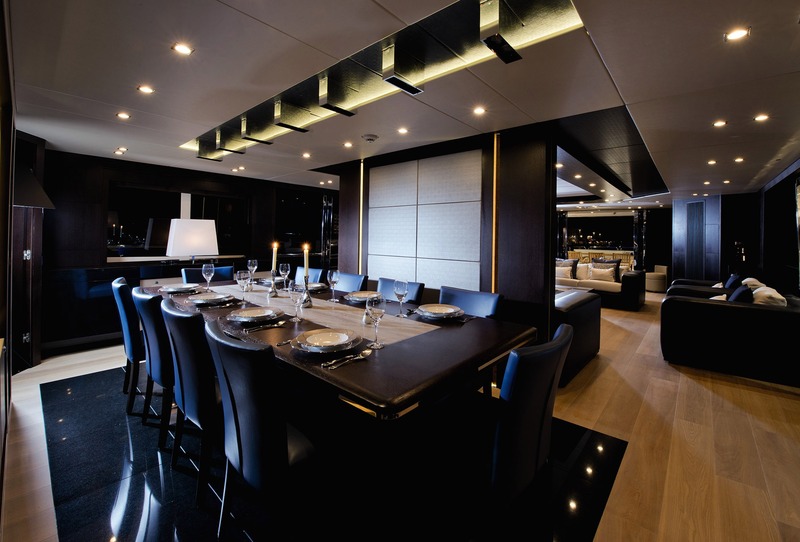 It features a mirrored ceiling that reflects the dining table well. Another mirror is installed next to the shelves to make it look more spacious. 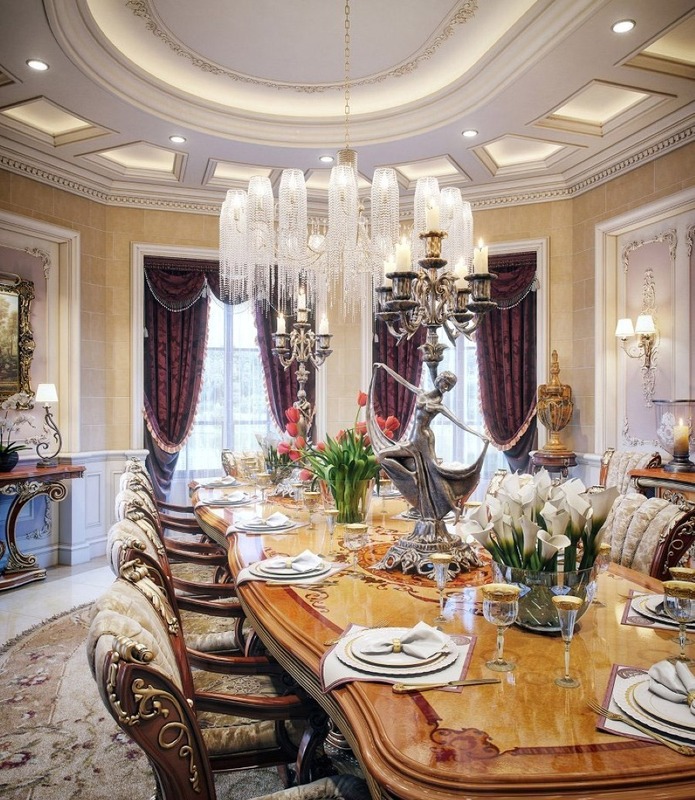 This room is furnished with luxurious furniture such as the crystal lamp hanging above the golden-leg dining table. The chairs are unique with their colorful finish and soft seats. When stepping into this room, you will feel like you are under the sea due to the vein of the marble floor and reflection on the ceiling made by the pendant lamp. The black leather chair with soft beige seats stand around the dining table. Even more, a peculiar spiral crystal lamp accentuates the room perfectly. Two abstract paintings hang on the wall, making a spectacular focal point. And to embellish the table, two beautiful flower bouquets are put on it. It is white, clean, and spacious. This dining room has all the elements of luxury. It is extremely white and clean which can make people want to linger over the dinner while bantering. And they will eventually enjoy the time you spend in this luxurious dining room. Eight glamorous white pendant lamps hang above the white table. A round golden decorative mirror hangs on the white wall, creating a lavish wall décor. 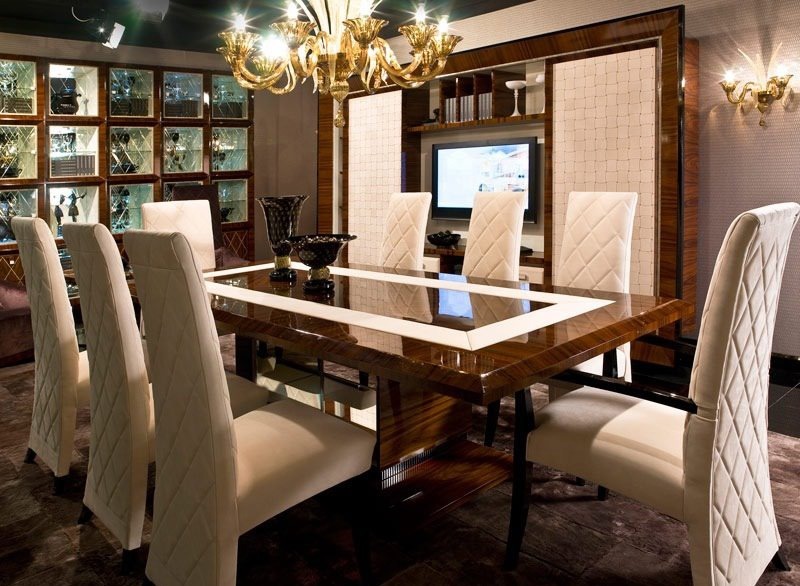 Investing on furniture with elaborate details can add the touch of luxury in your dining room instantly. 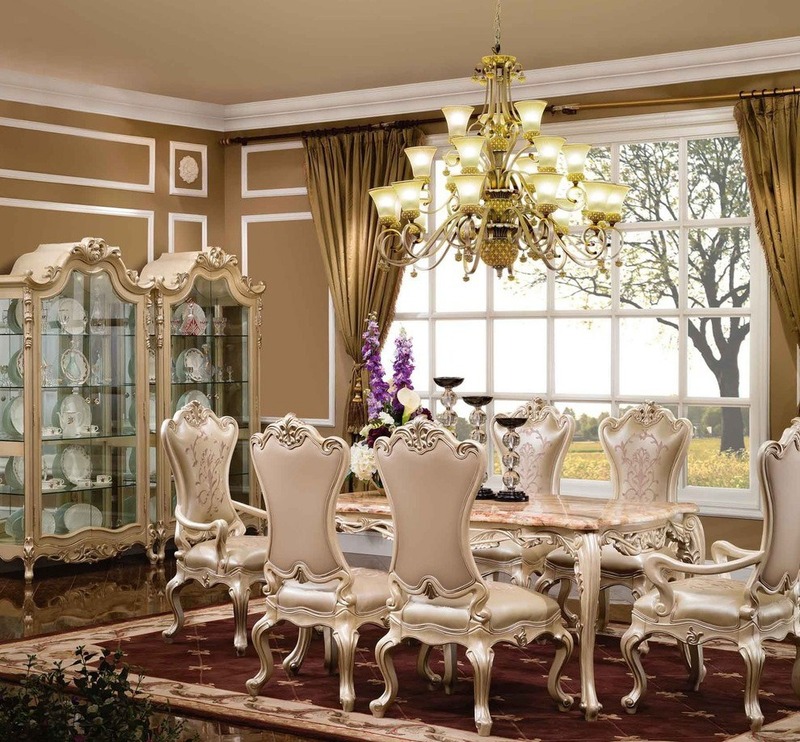 This dining room features a luxury table with pinkish top and finely carved white legs. The chairs complement the table perfectly with its details and colors. Two glass cabinets with sophisticated frames can be used to store plates and cups as well as showing them off. A golden pendant lamp hanging over the table making this dining room looked glamorous. As a perfect wall décor, a huge glass window is added. It enables you to enjoy the natural view while adoring every single bite of your meals. And to keep your feet warm, a maroon rug lies beneath the table and chairs. Black has always given the touch of elegance and boldness. Although this dining room is not furnished with furniture featuring elaborate details, it still looks fancy. The faux upholstery gives the clean look to the chairs and makes them look classy. Instead of rug, black large tiles lie under the dining table and chair, anchoring them well. Most luxurious dining room are spacious to get rid of the cramped look, but it doesn’t mean that your small dining room can’t be luxurious. To turn your small dining room into a luxurious one, you can try investing on white furniture and smaller dining table. A round table will be better as you can add more chairs without being awkward. Install a simple pendant lamp to give the touch of modern look. And for a terrific wall décor, hang a large abstract painting on the wall. Being luxurious doesn’t mean that you have to splurge out on the fancy furniture. 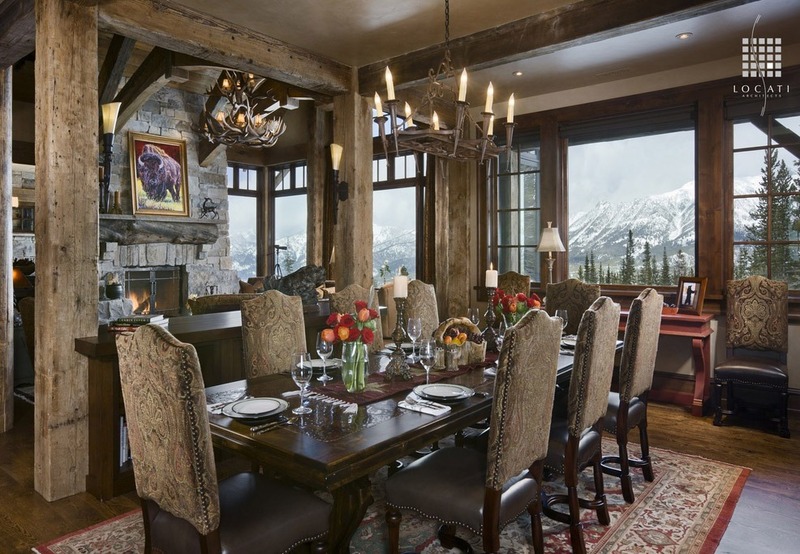 Even a rustic dining room can be luxurious if well decorated. Faux and olefin upholstery wrap the chairs well. And the small beads add an accent to the chairs. A candle-like light hangs over the wooden table, providing the dim light to the room. Instead of hanging a huge painting of nature, this dining room features huge glass windows that enable you to see the beautiful scenery. 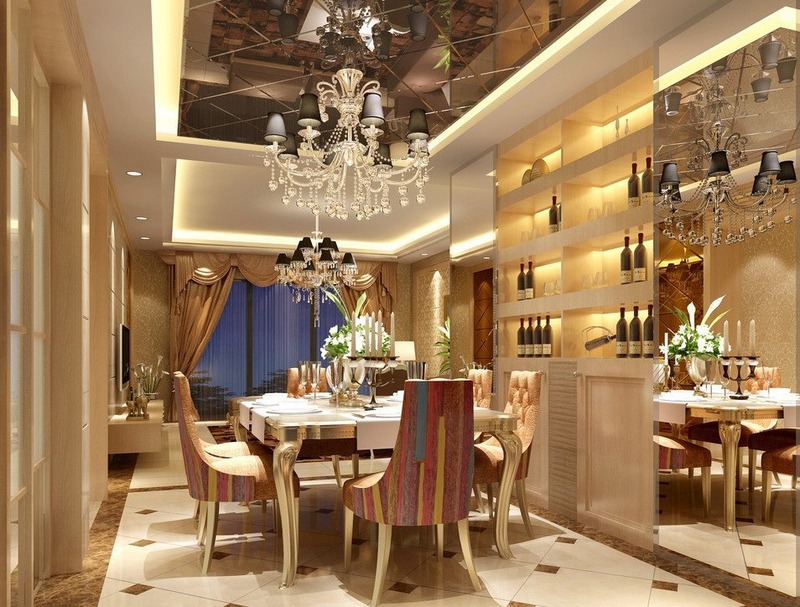 This dining room looks super fancy with the extravagant ceiling. A classy crystal pendant light accentuates the ceiling nicely. A large marble dining table is a perfect stage for the silver dancing lady that amuses the guests. Fancy chandeliers and beautiful flowers perfect the table well. To keep your feet warm, a large classic rug that has the same textures and patterns as the upholstery lies under the table. These luxurious dining room ideas will take your dinnertime to the next level. You will feel like you are eating out in a fancy restaurant with your family. Now, dinnertime is not just about making you feel stuffed, but it’s all about gathering and having a small talk with your family.